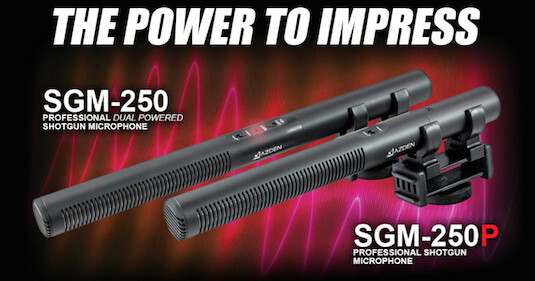 Azden recently reached out to me about their new SGM-250 and SGM-250P Shotgun Microphones. Both microphones are said to be 'Handcrafted in Japan' and use the same high quality mic element; the main difference being the SGM-250 runs on battery or phantom power while the SGM-250P runs on phantom power only. Now they've done a pretty good job explaining their new product and really dug into the technical specs of their microphones. They also have some excellent video and sound examples placed on a dedicated page found at http://www.azden.com/sgm-250-sgm-250p. I'm not going to do any technical examples, but I did do a simple test that should be fun for you guys to engage with. Azden has designed this microphone to be in the same space as microphones such as the Rode NTG-2 or Sennheiser MKE-600, so here's a basic example of the SGM-250 compared to the Rode NTG-2 Shotgun microphone. I thought this would be an interesting test as we all have difference preferences when it comes to sound. Let you guys decide which microphone sounded better, and also to see how many of you can correctly guess which microphone is which. So leave your best guess in the comment section below! For more information about the Azden SGM-250 and SGM-250P Shotgun microphones, visit their product page (found here). [Update 9.4.15] Click Here For Results! Updated in the comments. Posted in dslr video. Tags: azden, battery powered shotgun microphone, mke-600, ntg-2, phantom power microphone, Rode, sennheiser, sgm-250, sgm-250p, shotgun microphone on September 2, 2015 by Emm. Mic 1 had slightly more noise, but was not picking up the reverb as much from the room. I vote for Mic 1, it sound more crisp and clear. NTG1 & 2 are the same mic sound-wise, only difference is that NTG1 is phantom only. If you like the sound of the Azden or the NTG1/2 - great, that's all that matters. That said, among the Rhode shotguns, it is the NTG3 that gets a lot of praise from the pros, while the NTG1/2 is not held in the same regard, even for its price point. I don't believe a comparison to the Senn MKE600 is apt, as it is somewhat of a better mic for slightly more money. The comparison for NTG1, phantom only would be the AT875 which is cheaper and seemingly better, or the AT897 for the NTG2, which is about the same price point, and again a better mic. Again, if you like the sound of the Azden (or any mic!) - fantastic, and that's all that matters, but the NTG1/2 is not a great bar to pass and coming ahead of those mics is not much of a feat. Of course, everyone has their own opinion, and you should trust you ears. If Azden wants to step up their game, maybe they should go head to head with something a bit beefier quality-wise, like a NTG3 (of course, at a higher price point). I was pleased I liked the #2 Azden as well - Great test Emm! Thank you! So glad to see Mic 2 is the Azden. They've made a pretty good mic. Thanks for all the comments and guesses! Here's the results. Microphone 1 is the Rode NTG-2, and Microphone 2 is the new Azden SGM-250. Interesting how many people selected Mic 2 as their choice. Mic 2 was much cleaner. When will you post the results Em? I Prefer the sound capture of Mic #1. I listened to test through apple headphones on a portable device. @Mike - They are both on Phantom power. I was wondering did you use phantom power or battery power to record the example? I'm curious to know if there's a difference in performance on battery - maybe that's why there's noise in mic 1. I just can't tell which is which. But I some how like the Mic 2 right from the start. Mic 1 wasn't very pleasing to my ears, but as I kept listening some how both sounded same the second time. You guys are good. I could discern no difference between the two. I own the now older SGM-2X and always liked it but again, not an audio person. I can't guess which one because they sound exactly alike to my 55 year old ears. D'oh! So... which is it??? I really like the look of the shock mount on the azden. Can you comment on that? Mic 1 has some white noise in it. Could be the pre-amp if you had to raise the gain on that mic. Mic 2 has a hollow-ness to it that I didn't appreciate as well as it sounded muffled in the low end which made it less crisp sounding. I listened to this demo in my studio on a pair of KRK Rokit RPG2 studio monitors. I also prefer mic 2 but for some reason I think it's the Rode, however, I hope I'm wrong and will be pleasantly surprised that the Azden sounds that good. Rooting for it. @Caleb - Why NTG-1? The NTG-1 is Phantom only. The NTG-2 is both battery and Phantom exactly like the SGM-250. I'd say Mic 2 sounded better. I own the NTG-2 and hopefully it still stands the test of time. Surely an NTG1 would have been a more apt comparison? Very, very similar sound with just a difference in sensitivity it would seem. @Simon - Good point. Not a test i'd be able to do, but if we're talking about a coffee shop situation and 2 feet away, I might not be looking at these mics. I might be looking for something a little more high end. I noticed on a few words, Mic1 sounded a little smoother. As for background noise, close micing in a well built booth does not tell the whole story. A useful real life test for me would be 2 (or more!) mics overhead recording dialogue in a coffee shop type of situation. 2 feet away from voices (men and women). Off axis response has as much to do with the overall sound as sound coming right down the barrel 1 foot away. I am with both of you: I prefer mic 2. It has less noise and to me sounds a bit better, because the first is a bit more flat. However, I don't know which one is which, so I'll say Mic 2 was Azden. Mic one sounds more open thus also picking up a little more background noise (if there were any in the room) Mic two is to me a more closed sound, maybe easier to work with. Them seem to be very close in audio quality. I really liked the sound of mic two. I will guess that is the Azden. @bob345 - Interesting! You have very good ears. In order to get both to have equal levels, I did have to add a bit more gain in the Zoom H6 for one of them which may be a bit more noise from the H6 preamp. The other microphone did not require as much gain to get the same levels. I'm not going to say which one until others have finished commenting. I think i prefer mic 2 as it does not have the background noise that mic one does have. It also seems to have more emphasis on the midrange than mic one which will be desirable for those using that mic for things like interviews or speech. Mic one seems to have a flatter response over all, but the slight hiss in the backgrounds puts me off a bit. I haven't the slightest clue which one is which though as i have used neither.